Last but not least, today I am publishing a wonderful prawn salad with rocket leaves and lots of pomegranate seeds. Extremely easy to make and perfectly balanced, this dish is real treat!!! It will definitely become a classic at my dinner parties! Prawn salad with rocket and pomegranate. 1. Peel and devein the prawns, then poach in water for a few minutes. 2. Drain the prawns and let cool. 3. Place the arugula, the fennel, the spring onions and the celery in the plates, then add the prawns and garnish with plenty of pomegranate seeds. 4. Make the lime citronette. Mix 4 tablespoons of extra virgin olive oil with the juice of half a lime, then season with salt and pepper. 5. Pour the lime dressing over the salad and serve. Insalata di gamberi con rucola e melagrana. 1. Sgusciate i gamberi e togliete il budellino. Fate bollire i gamberi per qualche minuto. 2. Scolate i crostacei e fateli raffreddare. 3. Mettete i gamberi con la rucola, i chicchi di melagrana, il finocchio e i cipollotti nei piatti. 4. A parte, preparate la citronette di lime. Mescolate 4 cucchiai di olio extra vergine d’oliva con il succo di mezzo lime, sale e pepe. 5. Condite l’insalata di gamberi con la citronette di lime e servite. Barley is a cereal that has been used in dishes for thousands of years. It’s a wonderful and versatile ingredient: it can be used in salads and soups or cooked like a risotto. 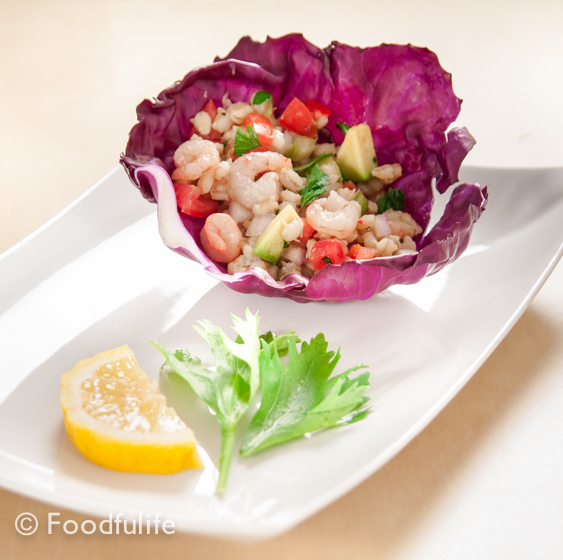 Today we are going to make a light barley salad with lots of fresh vegetables and shrimps! This colourful salad could be a great side dish for a barbecue or a buffet, but could also be served on its own as a light meal. 1. Pearl barley does not need soaking before cooking, it is simply boiled like rice. 2. Wash the barley under running water for a few minutes before cooking it, to remove its natural bitter taste. 3. For this recipe I am using a red Tropea’s onion, a delicious onion variety, available in Italy. If you don’t find it, you can use shallots instead. Shallots and Tropea’s onions are perfect for this recipe because they are naturally sweet and have a pleasant delicate flavour. Barley and shrimp salad in red cabbage leaves. 1. Cook the pearl barley in vegetable broth (I used an organic stock), for 40 minutes (the cooking time will vary depending on the variety of barley). 2. Boil some water in a sauce pan, then turn off the heat and poach the shrimps for 3-4 minutes. Drain and set aside. 3. Wash and dry the cabbage leaves. Peel and slice the onion and avocado, then set aside. Wash, dry and cut the celery and tomatoes. 4. Mix all the vegetables (including the chopped parsley) with the cooked barley and shrimps. Serve the salad in cabbage leaves and season with salt, pepper and lemon juice. Cestini di insalata d’orzo e gamberetti. 1. Fate cuocere l’orzo perlato nel brodo per 40 minuti (il tempo di cottura può variare a seconda della qualità di orzo). 2. Fate bollire una pentola piena d’acqua, poi spegnete il fuoco e immergetevi i gamberetti per 3-4 minuti. Scolate e mettete da parte. 3. Lavate e asciugate le foglie di cavolo. Pelate e tagliate le cipolle e l’avocado. Lavate, asciugate e tagliate a cubetti il sedano e i pomodorini. 4. Mescolate tutte le verdure (compreso il prezzemolo) con l’orzo e i gamberetti. Servite l’insalata nelle foglie di cavolo e condite con sale, pepe e il succo di limone. A touch of exotic flavour in this light stir-fry recipe. By now you all know, I like to prepare different things and vary my diet. Well, this week I thought that a stir-fry would be really lovely to celebrate the warm weather. I could just imagine enjoying this dish with a nice glass of chilled white wine during a lovely sunset, sitting by the sea…Just perfect!! Prawns with pineapple in sweet and sour sauce. 1. Cut and clean the pineapple, removing all the hard parts (including the centre). 2. Wash and cut the bell pepper, then wash and slice the radishes. 3. In a frying pan (or a wok), sauté the garlic and the spring onions for a few minutes with 3 tablespoons of extra virgin olive oil. 4. Add the pineapple and bell pepper, cut into small cubes. Fry for 5 minutes, then add the prawns and stir. 5. Separately, mix the lime juice with the soy sauce, previously diluted with a little bit of water. Pour into the pan and stir well. 6. Stir fry over a medium heat for a few minutes, then turn off the heat. Add the crunchy radishes, season with black pepper and serve with a cup of steamed basmati rice. You can add some fresh chillies if you wish. 1. Tagliate e pulite l’ananas, togliendo tutte le parti dure (compresa la parte dura al centro). 2. Lavate, tagliate a pezzi il peperone e affettate i ravanelli. Mettete i ravanelli da parte. 3. In una padella (o un wok), fate soffriggere i cipollotti e l’aglio per qualche minuto, in abbondante olio extra vergine d’oliva. 4. Aggiungete l’ananas e il peperone (tagliati a cubetti abbastanza piccoli). Fate soffriggere per 5 minuti, poi aggiungete i gamberi. 5. A parte, unite il succo di lime alla salsa di soia, precedentemente allungata con un po’ d’acqua. Amalgamate il tutto e versate il condimento in padella. Mescolate bene. 6. Fate friggere a fuoco medio per qualche minuto, poi spegnete il fuoco e aggiungete le fette di ravanelli. Servite con del riso basmati e aggiungete del pepe e/o peperoncino, se lo desiderate. Anyway, I loved it! So I changed the recipe completely and I made a light balsamic vinaigrette as a salmon dressing. I know it is not a new combination, but it was the first time for me. I love the way in which the balsamic vinegar aroma enhances the natural sweetness of salmon without covering its delicate flavour. The aniseed-tinged wild fennel leaves add a note of distinctive freshness to the recipe. If you can’t find wild fennel, you can use normal fennel leaves, they are probably a little bit easier to get and very similar in taste. Salmon with lime and balsamic vinaigrette. 1. Wash and cut a lime into thin slices, then put a few slices on top of the salmon, with a sprig of wild fennel. 2. Steam the salmon steaks for 8-10 minutes. 3. Place the salmon steaks on the plates, garnish with a few radishes and the celery, both finely sliced. Then, add some wild fennel leaves (roughly chopped). 1. Mix 2 tablespoons of extra virgin olive oil with 2 tablespoons of balsamic vinegar, a few drops of lime juice, salt and pepper to taste. 2. Serve with the vinaigrette on the side. Salmone con lime e aceto balsamico vinaigrette. 1. Lavate e tagliate un lime a fette molto sottili. Mettete le fette di lime sul salmone, con qualche rametto di finocchio selvatico. 2. Fate cuocere a vapore i tranci di salmone per 8-10 minuti. 3. Disponete il salmone sui piatti, guarnite ogni piatto con tre ravanelli tagliati a fette molto sottili e con un gambo di sedano tagliato alla julienne. 1. Mescolate 2 cucchiai di olio extravergine d’oliva con 2 cucchiai di aceto balsamico, qualche goccia di succo di lime, sale e pepe. 2. Servite il salmone con il condimento a parte.